My name is Sirje and I’m from Estonia, a small country in Northern Europe. 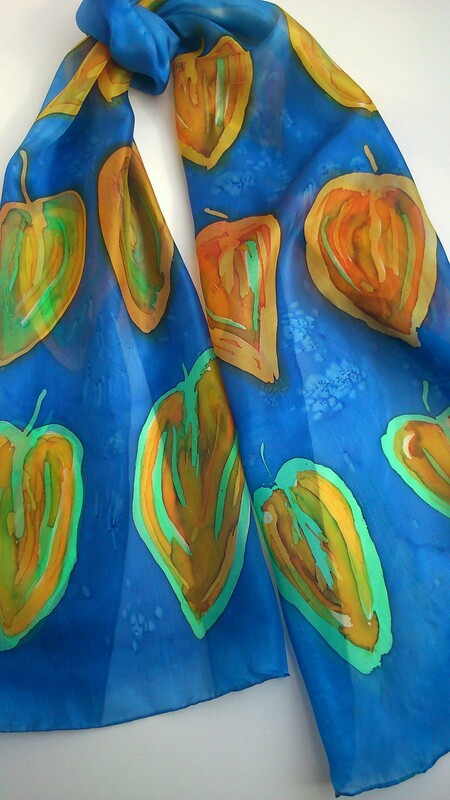 I’ve been interested in crafts and design earlier, but now when I discovered the charm of silk painting, it takes all my time. I’ve been painting for 6 years now and I’m basically a self taught artist. I’ve attended several courses and workshops to get my basic knowledge and Maria Jürimäe is my dear mentor in this field. The atmosphere at her courses is very creative and fruitful. What inspires you in paintings? I love colors and silk as a material and the process of painting, but it has become by far more for me than a hobby just now. It is a way of life and joy in painting which I practice. Now I have started to observe nature and seasons and save the color palette in my memory. 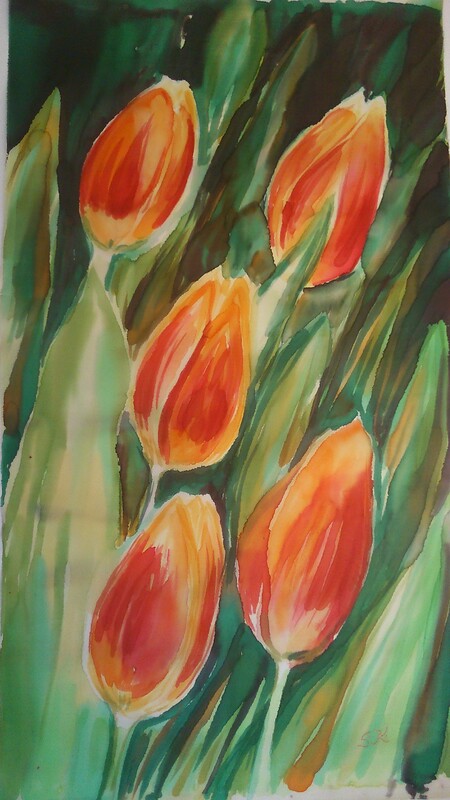 Quite often when seeing a lovely view or nice flower I think on my own: "How would it look like when painted on silk?" There are often flowers or motifs which talk to people. I called my Etsy shop SilkLetters because my paintings are like letters on silk to my audience about what I have seen or what I consider important. Your favorite silk type, resist. I like dyes fixed by steam by Pebeo and Marabou, I often use Marabou golden gutta which gives the scarves a more festive look. I get all my materials from our local sellers Vunder and Scanimpex. My two children are grown-ups now and as soon as my daughter started with her own life I moved my painting studio into her former room. My husband made the frames for the scarves and so I was free to paint and experiment. 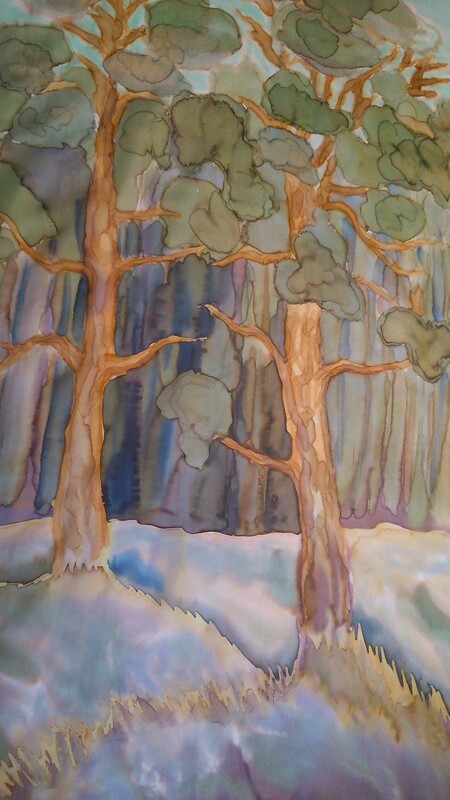 I am a full time office worker and silk painting is such a pleasant change for me. I have tried several painting techniques and there’s a lot to discover, but wax batik technique is one of the most interesting one for me. When painting you’ll have to visualise the result and think in “layers” as you apply the colors and hot wax. There is always a “Wow!” effect after the wax has been removed. I've also tried painting without any resistant and this process may bring you to meditation, but sometimes you must react very quickly, depending how the colors behave. I think that every silk painter has had her “mistakes” which are actually our valuable lessons. Etsy has given me the opportunity to learn more about fabulous silk painters and introduce my work.